Bernard Plossu is the guest of honour of the Parcours photographique 2013 organized by the association "Are you experiencing ?" in Le Havre. After the Musée des Beaux-Arts in Besançon, the 220 photographs of the artist's trip through Mexico (1965–1966) will be on display at MuMa. The first section presents some two hundred photographs of Bernard Plossu's first trip to Mexico in 1965–1966. An experience that changed the photographer's life. Newly arrived in Mexico to meet his maternal grandparents, he roomed with a group of young American students, whose lives he shared and photographed over a period of a few months. Then, for two years, he captured his road trip on film, immortalizing the search for others, the sensations of freedom. He participated in Zashen Maax's exploration expedition in Chiapas, on the border of Guatemala. He didn't find the lost temple, but his encounter with the Lacandon people made a profound impact on him. Several themes emerge from the images, which are organized into five series. "Mexican Nights" shows the festive nights spent with the young American students. Bernard Plossu captures the parties, marijuana and joy of life that are an integral part of the daily lives of these young hippies. "On the Road" presents the road trips, travels and hitchhiking through the desert landscapes of Mexico. "The Mexico of Markets" takes us to the La Lagunilla flea market, teeming with life and traditional objects, in 1965. "Mexican Countryside" shows the rural landscapes of a traditional land, unaffected by the passage of time. "Mexico Modern City" reveals a South American megalopolis undergoing rapid modernization. 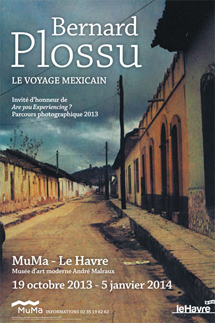 Some of these photographs appeared in Le voyage mexicain, published in 1979 by Editions Contrejour. The second part of the exhibition presents a selection of 37 colour photographs from his Mexican trip of 1965–1966. These colour prints were made using the Fresson technique, a permanent carbon print process invented in 1855 by Alphonse Louis Poitevin. Théodore Henri Fresson perfected the technique, which was still monochrome, in the late 19th century. Many of the pictorial photographers from the last century were keen on using this process. In 1952, Pierre Fresson, one of the sons of Théodore Henri Fresson, applied the process to colour printing. Carbon prints stand the test of time because they are not composed of a metallic layer, which can oxidize, but rather a pigment: originally carbon powder, now gouache or watercolour. "With the Fresson process, there are no harsh colours, and each print is unique, almost in relief. You can feel the seasons, the trees quiver, the wind murmurs... In short, Michel Fresson is my translator," explains Bernard Plossu.